Anonymous hackers once again hit Egyptian Government Websites and taken down. 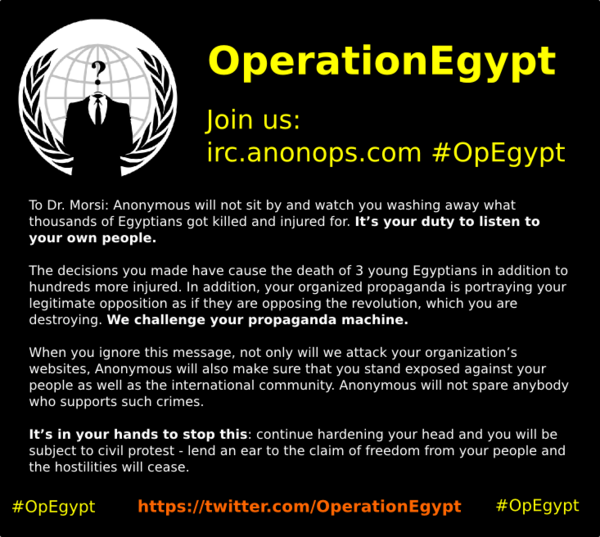 Hackers react under operation named #OpEgypt and hit 30 websites with DDos attack. Hacktivist using the handle @AnonymousGrupo claimed the responsibility of attack. Attacked websites include, The Egyptian Presidency website, The Egyptian Cabinet, Trade Agreements Sector (TAS), Maritime Transport site, Central Agency for Public Mobilization and Statistics, parliament website, Income Tax and many more. At the time of writing, many sites has been restored, but a few like http://www.presidency.gov.eg/ is still under maintenance. The Reason of Hack is mentioned in the banner shown above, was posted their facebook page. Readers can find list of sites under attack at Pastebin Note here.